Inside, you'll find detailed explanations of every control and every feature, including full-color illustrations showing how changing each setting will affect your photos. But this book's greatest strength isn't its focus on the camera; it's the detailed, easy-to-follow instruction it offers on using your camera to take superior photographs. 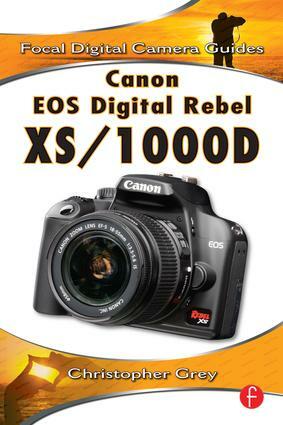 The lens, the subject matter, the light-all these variables are covered in depth, and always in the context of the Canon EOS Digital Rebel XS/1000D. Chris Grey is an international award winning photographer, instructor, author and owner of Christopher Grey Studios, (Minneapolis, MN, USA) who has specialized in advertising, portrait and fine art photography for over three decades. Current advertising clients include The Home Depot, Midwest Dairy Association (Got Milk?) and ClearChannel Communications. Grey also writes monthly columns on professional lighting tips and techniques for ShootSmarter.com and ProPhotoResource.com, free sites loaded with information for digital photographers. He is the author of numerous photography books, including CANON DSLR: The Ultimate Photographers Guide, also from Focal Press.